Here’s a fast, simple idea for you to build a strong online audience and reputation for your business. 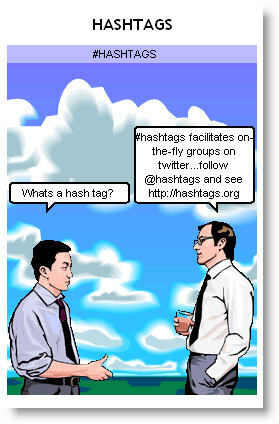 The next you’re holding a big meeting, event, seminar, etc… start the event with a promotional hashtag! What’s a hashtag you ask? It’s a Twitter term, and hashtags are used to build a conversation around a specific subject. For example, let’s say you’re holding a real estate conference in Atlanta. Your hashtag could be #atlantaprop. At the very beginning of your seminar, you announce to everyone that the seminar hashtag for Twitter is #atlantaprop. Now, everyone attending that seminar can build a conversation around your seminar with the #atlantaprop hashtag. But more importantly, everytime the attendees send out a tweet with the hashtag #atlantaprop, all of their followers, who are presumably not at the meeting, will get the updates as well! This is a powerful idea to build an online audience around your seminar or event, get the attendees discussing the event via Twitter, provide instant feed back from attendees about what they think about your seminar, and last but not least, spread the word virally to a massive audience about your seminar. Surely there is unlimited value, both directly and indirectly, wrapped up in this one simple idea.